This is one of Benromach’s rarest expressions to date. Crafted at the Distillery before the Urquhart family, owners Gordon & MacPhail, revived it in 1998. This has to be special as very few casks of Benromach remain from this time period. Distilled in 1980 in First Fill Sherry Casks. Presented in a dark oak box which represents the wood of the original washbacks at the distillery. Looking forward to this tasting, so lets taste. 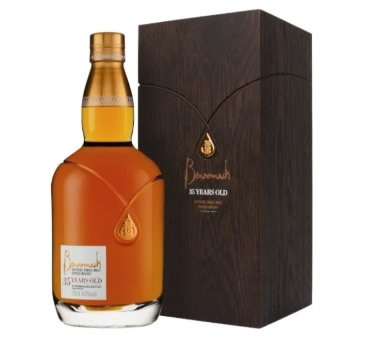 Benromach 35 Year Old Speyside Single Malt Scotch Whisky, 43% Alc/vol. Nose…This one is complex it seems to have everything starting with rich Sherry soaked sultanas, loads of citric notes, rich fruit cake, strong Dundee marmalade, a touch of Christmas spices. Taste…The first sip gives you the feeling that you should be chewing rather than drinking, sweet and fruity, honey drizzled over a rich fruit scone, loads of oranges and grapefruit, a slight hint of sweet peat/tobacco smoke but only a little, charred lollipop stick, you cannot miss the sherry influences, it changes every time you go in, this certainly has the WOW factor. Finish… Medium finish, mainly the orange and the burnt lollipop stick the sweet and fruity note are gone too quickly. Just loved it, all the complex notes with sweet notes and also a little spicy and the surprise was the wee hint of smoke, gladly enjoy this after a large family dinner. 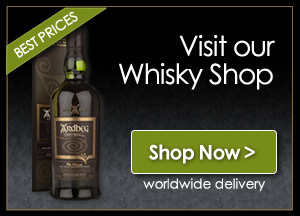 Priced at a little over £400.00 it will not be in everyone’s shopping list, but The Whisky Boys certainly recommend that if you get a chance to have a taste, do not hesitate this is an outstanding dram. Well done to all at Benromach, this one is a triumph. Timorous Beastie Turns the Big 4 0!